My healthy makeover of a classic stick-to-your-ribs comfort food is the perfect dish for the holidays. Back by popular demand, this month’s Recipe Redux theme is Grab a Book & Cook. Since the Recipe Redux has been around for 54 months, we were challenged to grab a cookbook and make a healthy version of the recipe on page 54 or 154. What a fun concept! I have a ton of cookbooks so I started going through them and soon found the perfect recipe to Redux- Chicken and Dumpling Soup from Michael Symon’s Live to Cook: Recipes and Techniques to Rock Your Kitchen. 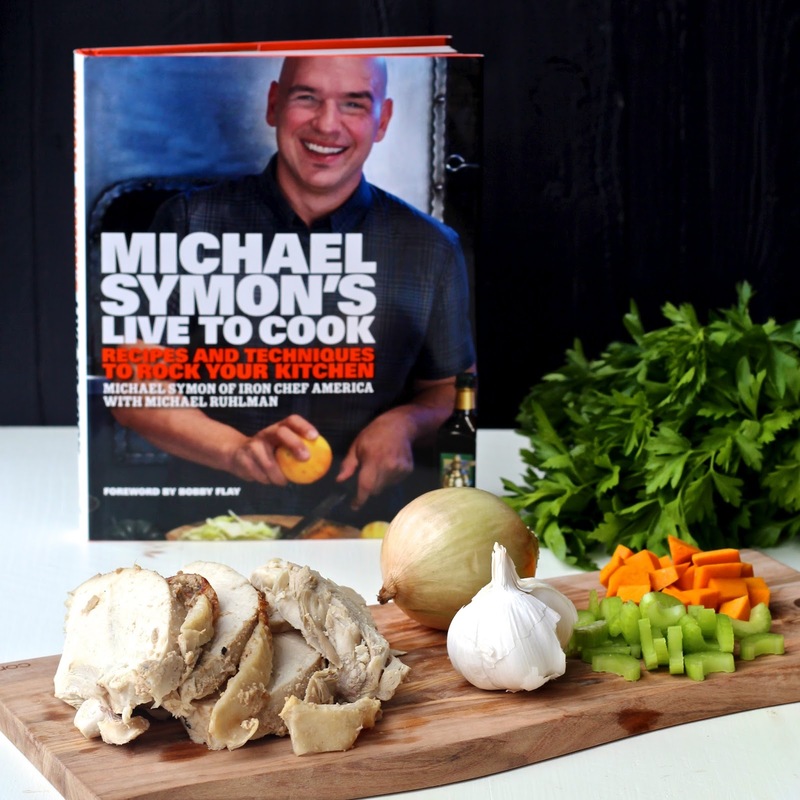 Michael Symon is one of my favorite celebrity chefs. His food always looks amazing- it’s no wonder he always wins his battles on Iron Chef. Plus, he just seems like a genuinely nice guy. In his description of his Chicken and Dumpling Soup, he writes that his grandfather made this soup for just about every holiday he could remember. So for him, it’s a recipe that remains bound up with family and celebration and love. What better time of year to share such a special recipe? heard of it, it’s basically a homemade chicken soup. You make the soup by simmering a whole chicken in a pot with water, vegetables and seasonings, creating a flavorful chicken stock. Then the chicken is shredded and added back to the stock. The dumplings are made with a biscuit-like dough that’s dropped into the hot stock and cooked in the liquid. The result is a delicious, comforting and hearty meal that’s perfect to warm you up on a cold day. My version of the dish is not only lighter, it’s also a lot faster. The classic version is delicious but takes a few hours to prepare (Chef Symon even recommends making it over the course of two days to be able to properly de-fat the stock). I took a few shortcuts with the recipe to make this a meal that can be prepared on a busy weeknight. My dish uses rotisserie chicken (leftover turkey works well too) and prepared chicken stock. If you have homemade chicken or turkey stock, definitely use it- the better the quality of the stock, the more flavorful the soup will be. I actually used leftover homemade turkey stock that I had in my freezer from Thanksgiving, and it gave the dish rich flavor. I decided to lighten the dumplings considerably by using buttermilk instead. When the buttermilk reacts with the baking powder, it makes for a tender and light dumpling without having to use any fat or butter (see notes at the end of the recipe for how to make homemade buttermilk)! Traditionally, chicken and dumplings is made with celery and carrots but I had some Calabasas squash that I substituted for carrots and it turned out delicious. You could also add some peas for some extra color and texture. Many chicken and dumpling recipes also add heavy cream at the end to thicken it and add richness. To cut down on fat, I stir a little flour into mine instead. Wishing you all a wonderful holiday season and a happy and healthy New Year! Heat the oil in a large stockpot over medium heat and add the onion, celery, squash and garlic. Sautè the vegetables until they start to soften, 4-5 minutes. Sprinkle the flour on top and stir to combine. Cook 1-2 minutes, then add the thyme, bay leaf and chicken stock. Bring to a simmer, then cover and simmer until the vegetables are cooked, about 10 minutes. Stir in the chicken, parsley, lemon juice and salt and pepper to taste. To make the dumplings, whisk the flours, baking powder, and salt together in a medium bowl. Stir the buttermilk, egg and parsley together in a second bowl. Pour the wet ingredients into the dry ingredients and gently fold until just combined. Using two spoons, drop balls of the dumpling dough into the simmering soup (you should have about 18 dumplings). Each dumpling should be about two teaspoons big- they will expand a lot in the soup. Cover the pot and cook until the dumplings are fluffy and cooked through, 10-12 minutes. Garnish with chopped parsley and plenty of black pepper. * If you don’t have buttermilk, you can make it by stirring 1 ½ teaspoons fresh lemon juice into ½ cup milk (any type). Let the mixture sit for a 5-10 minutes until it thickens slightly and small curds form. Use as directed in the recipe. Check out below to see what my fellow Recipe Reduxers did with this fun challenge! I'm a fan of Chef Symon as well, and I love your lighter version of the soup. I've never made a dumpling soup before and just may have to try it now. My boys would love this (and so would I). BTW, I want your Le Creuset! This is absolutely gorgeous Sonali, and looks so delicious and healthy! I do have an ingredient sub question though- my boyfriend is lactose intolerant and I was wondering if you knew of something I could substitute for the buttermilk that would react similarly to the baking powder to create those gorgeous biscuits (love that you didn't use butter or heavy cream!). Thanks! Thanks for your question Cindy! You can make the buttermilk substitute as mentioned at the end of the recipe using a dairy-free milk like soy milk or coconut milk. Stir 1 1/2 teaspoons fresh lemon juice into 1/2 cup of milk and let it sit for 5-10 minutes, then use as directed in the recipe. Let me know how it turns out! Another spectacular recipe by Sonali!!! Pinning! 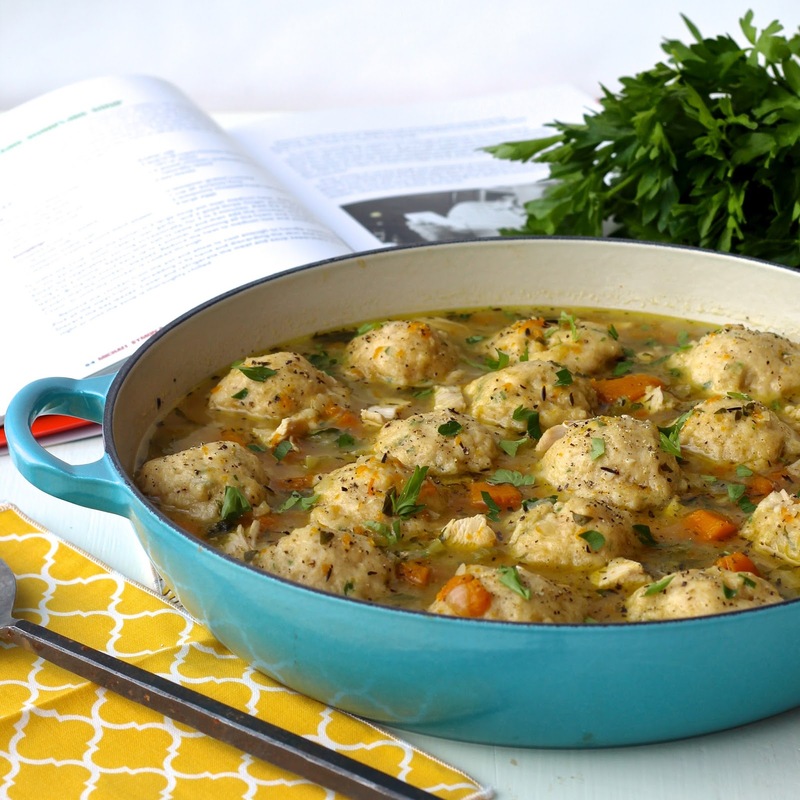 OHMEGAWSH – Sonali – I cannot wait to try this lightened up version of chicken and dumplings! Merry Christmas! this is my boyfriends fav food and i think i will make it for him very soon. it looks so comforting!!! 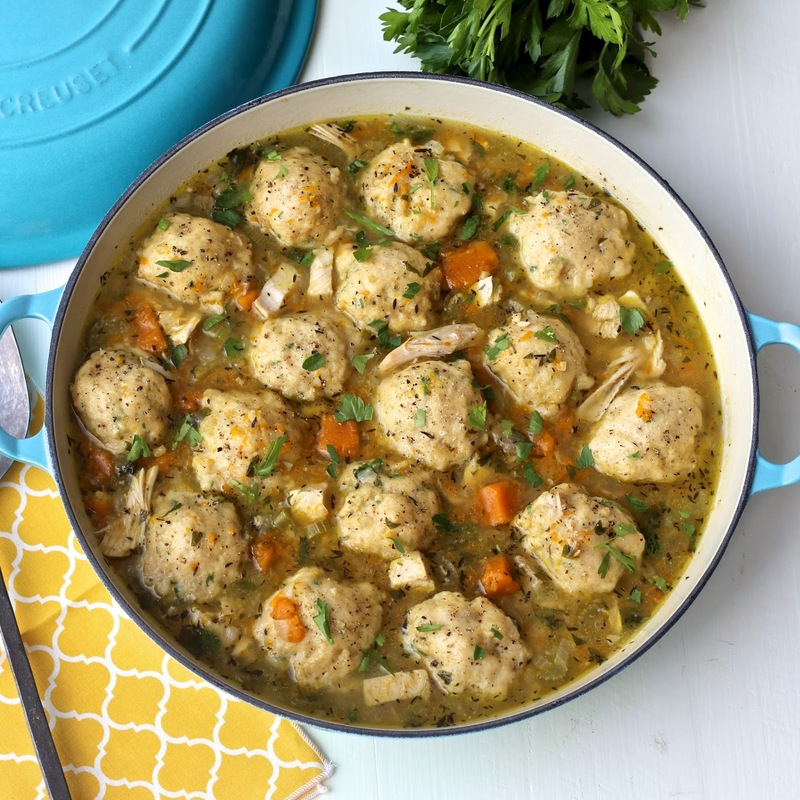 My mom used to make awesome chicken and dumpling soup growing up- it was one of my favorite meals so I will need to keep this healthier twist in mind to share for next time! Used to be one of my favorite childhood dishes! 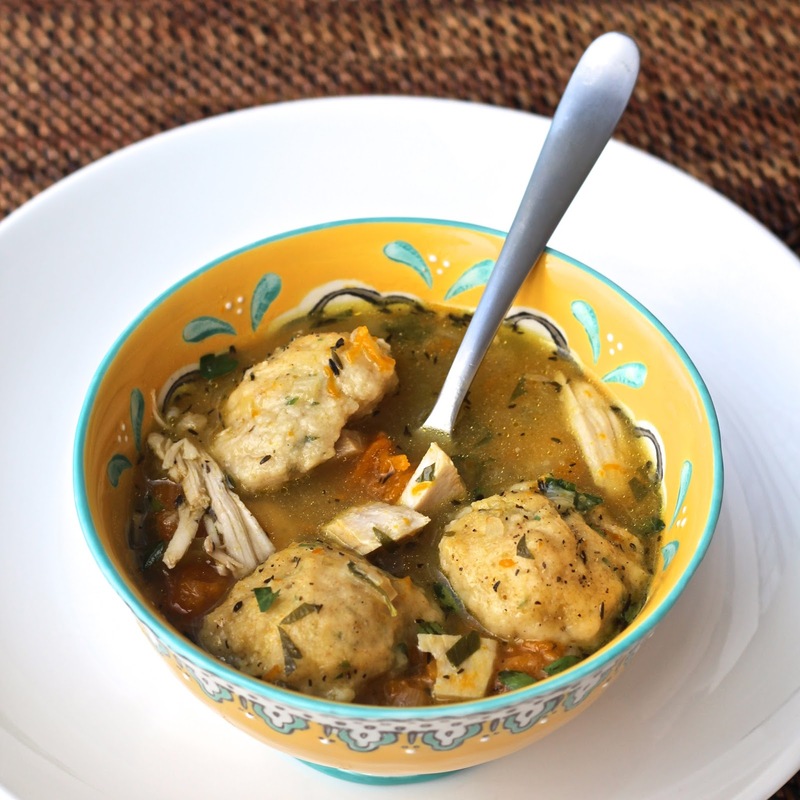 I've never had chicken and dumpling soup, but I know my husband would love it! And it really looks like the perfect comfort food for the winter. btw, I LOVE your blue Le Creuset! I'm with you! I adore Michael Symon and his hearty laugh ;). Gosh I can't remember the last time I had chicken and dumplings but it sure looks comforting! I like your version much better since I don't have 2 days to prepare a dish these days! You make everything look so so good! What a great recipe! I love this. My family has this every Christmas, no joke! My dad makes his infamous chicken and dumplings but between you and me, I can't eat it! He's a big fan of more butter, more flavor. The amount he adds to his makes me turned off! I wonder if I can sneak in this one year and win him over :). Pinning to try! I'm sad to say I've never had chicken and dumplings! This dish looks like the perfect comfort food, and I like how your version is fast because I'm all about fast meals these days! This chicken dumpling soup looks so flavourful and comforting! It's 40C weather here but all I want to do is fire up the stove and get this cooking 🙂 Looks delicous!